Noe Valley (/ˈnoʊ.i/ NOH-ee) is a neighborhood in the central part of San Francisco, California. 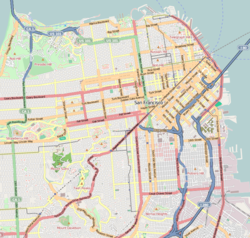 Roughly speaking, Noe Valley is bounded by 21st Street to the north, 30th Street to the south, Dolores Street to the east, and Grand View Avenue to the west. The Castro (Eureka Valley) is north of Noe Valley; the Mission District is east. The neighborhood is named after José de Jesús Noé, the last Mexican alcalde (mayor) of Yerba Buena (present day San Francisco), who owned what is now Noe Valley as part of his Rancho San Miguel. Noé sold the land, later to be known as Noe Valley, to John Meirs Horner, a Mormon immigrant, in 1854. At this time the land was called Horner's Addition. The original Noé adobe house was located in the vicinity of the present day intersection of 23rd Street and Douglass Street. Along with nearby neighborhood Corona Heights, Noe Valley was the site of two quarries until 1914. Noe Valley was primarily developed at the end of the 19th century and at the beginning of the 20th century, especially in the years just after the 1906 San Francisco earthquake. As a result, the neighborhood contains many examples of the "classic" Victorian and Edwardian residential architecture for which San Francisco is famous. As a working-class neighborhood, Noe Valley houses were built in rows, with some of the efficient, low-cost homes being more ornate than others, depending on the owner's taste and finances. Today, Noe Valley has one of the highest concentration of row houses in San Francisco, with streets having three to four and sometimes as many as a dozen on the same side. However, few facades in such rows of houses remain unchanged since their creation in the late 19th and early 20th century. St. Paul's Catholic Church, also known as Parroquia De San Pablo, is a famous church located at Church and Valley Street. It was the filming location for the movie Sister Act. Like many other San Francisco neighborhoods, Noe Valley started out as a working-class neighborhood for employees and their families in the area's once-thriving blue-collar economy but has since undergone successive waves of gentrification and is now considered an upscale neighborhood. It is home to many urban professionals, particularly young couples with children. It is colloquially known as Stroller Town, for the many strollers in the neighborhood. The median sale price for homes in Noe Valley as of September 2015 was $2.37 million. One of the attractions of Noe Valley is that the adjacent Twin Peaks partly blocks the coastal fog and cool winds from the Pacific, making the microclimate usually sunnier and warmer than surrounding neighborhoods. Public transit includes the J Church, which runs down Church Street until 30th Street. The 24 Muni Bus also runs through Noe Valley. Its route comes from the north on Castro Street and switches to Noe Street at 26th Street. It then exits the neighborhood via 30th Street. The neighborhood is primarily residential, although there are two bustling commercial strips, the first along 24th Street, between Church Street and Diamond Street, and the second, less dense corridor along Church Street, between 24th Street and 30th Street. Ruth Asawa was a resident of Noe Valley from 1962 until her death in August 2013. Carlos Santana graduated from James Lick Middle School on Noe Street in the early 1960s, as did Benjamin Bratt in the following decade. Famous residents include Scott Hutchins, Evan Williams, Mark Zuckerberg, and Terry Karl. ^ a b "Statewide Database". UC Regents. Retrieved October 9, 2014. ^ a b "Noe Valley neighborhood in San Francisco, California (CA), 94110, 94114, 94131 subdivision profile - real estate, apartments, condos, homes, community, population, jobs, income, streets". city-data.com. Retrieved 24 January 2015. ^ "Billy Goat Hill". Noe Valley Voice. Retrieved 20 April 2013. ^ Cerny, S.D., An Architectural Guide to San Francisco and the Bay Area, published by Gibbs Smith, Layton, Utah, 2007, page 78. ^ "Price Survey". Retrieved 20 September 2015. ^ "James Lick School Celebrates 75th with Santana". noevalleyvoice.com. Retrieved 24 January 2015. Wikimedia Commons has media related to Noe Valley. This page was last edited on 11 January 2019, at 05:19 (UTC).